The HP Laserjet Pro P1102 printer is a mono laser printer. This budget printer has proved to be an effective and useful addition to home or office. On the purchase of the HP Laserjet Pro P1102 printer, a HP Laserjet Pro P1102 Toner Cartridge is shipped along with the package. The HP Laserjet Pro P1102 printer weighs about 5.3 kg which makes it easy to handle. It is 7.71 inches in height and 13.74 inches in width. 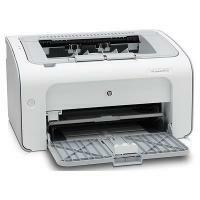 The minimum depth of the HP Laserjet Pro P1102 printer is 9.38 inches and the maximum depth is 16.15 inches. The HP Laserjet Pro P1102 printer come with some interesting features that allow the user to have the ease of good print quality with easy to use attributes . You can print using a USB cable. It is compatible with Windows, Linux and iOS devices. The capacity of the main input tray is 150 A4 sheets. It can also hold up to 10 envelopes. However the capacity of the output tray is 125 sheets. The HP Laserjet Pro P1102 printer offers a print resolution of 600 X 600 dpi for text as well as graphics. It can print up to 18 pages per minute. It prints at a speed of 8.5 seconds roughly. The HP Laserjet Pro P1102 Toner Cartridge that the printer uses, has the optimum ink for good print quality. The printer uses 360 watts to print. The HP Laserjet Pro P1102 printer is a budget printer and give good print quality. This budget printer also qualifies for Energy Star. However the absence of Ethernet or Wireless connectivity makes it’s use limited to the place. The printer also does not offer auto duplex feature. In all, the HP Laserjet Pro P1102 printer plays a good role as a mono laser printer but the absence of certain features makes it difficult for some users. How to replace the HP Laserjet Pro print cartridges? When the HP Laserjet Pro P1102 toner cartridges approaches the end of its life, you can continue printing with the current cartridge until redistributing the toner no longer yields to acceptable print quality. Q. What is the Cleaning Page feature in HP Laserjet Pro P1102 printers? Make sure the printer is idle and the Ready LED on the machine is on. On the Device Settings tab, press the Start button in the Cleaning Page section. The HP LaserJet Cleaning Utility starts. Load overhead transparency or copier grade paper with a smooth surface. Press “OK”. The cleaning process will take about two minutes to finish. Q. I have been using standard HP Laserjet Pro P1102 toner cartridges (CE285A) with my printer. I was wondering whether you supply toner cartridges with a higher page yield for this printer? A. Yes, you we do provide higher yielding toner cartridges for HP Laserjet Pro P1102 printers. These higher yielding toner cartridges (CE285X) are capable of printing twice the number of pages than that of standard toner cartridges. They are capable of printing up to 3000 pages. Q. What does it mean when the ready light and the toner light on my HP Laserjet Pro P1102 printer are on together? A. When the toner light and the ready light on your printer are turned on at the same time, the toner level of your HP Laserjet Pro P1102 toner cartridge is low and the toner cartridge is almost exhausted. This is to notify you to replace the toner cartridge with a new one so that your print job will not be disrupted. Q. Are your compatible HP Laserjet Pro P1102 toner cartridges good quality cartridges? A. Absolutely! All our toner cartridges are of high quality that have been through many quality tests. They are designed to work with your printer without causing any problems. Q. I had recently ordered HP Laserjet Pro P1102 toner cartridges from your website. When I received the product, I realised that the toner cartridge was leaking. I want a replacement for this. A. We are truly sorry for the inconvenience caused to you. For a replacement, please contact us on 048 30833221 or email us on info@printerinkcartridges.ie within 30 days of receiving your product and we will be with you throughout the process. Q. How can toner consumption be controlled using HP Laserjet Pro P1102 printer? A. If you are running out of toner in your HP Laserjet Pro P1102 toner cartridges you can use EconoMode in your HP printer which will extend the lifetime of your cartridge. But you will not get high-quality printouts using it. So, it is recommended that EconoMode should be used at the time of urgent requirement only when you are short of cartridges otherwise it might damage the printer. Q. Does this printer offer wireless connectivity? A. Unfortunately, the printer does not support wireless connectivity and the option for ethernet connectivity is also not applicable. Q. Will using the compatible HP Laserjet Pro P1102 toner cartridges spoil my printer? A. No, It is unlikely that using the compatible cartridges printer warranty gets spoiled. The only case where a printer can get spoilt by a cartridge is when you are using substandard parts, or incompatible toners that are not tested and cleaned thoroughly before refilling. Q. Is HP Laserjet Pro P1102 a monochrome multifunction printer? A. Sorry, but the HP Laserjet Pro P1102 is not a multifunction printer. Only monochrome printing is supported by this printer. Q. What is the capacity of holding a paper in a tray? Can I print the maximum number of pages using HP Laserjet Pro P1102 printer paper output tray? A. The paper handling capacity of the main input tray is 150 for A4 type sheets. While the capacity of handling papers using the output tray is 125 sheets, which is quite good if you are using it for home or small office purpose. Q. Are all the compatible HP Laserjet toner cartridges are same? A. No, the Compatible toner cartridge is made in a number of different ways, each affecting the print quality and page yield. We at Printerinkcartridges.ie make certain compatible toner cartridges that are well tested and provides a proof of certification to ensure you're getting a true compatible HP Laserjet Pro P1102 toner cartridges that will last for as long as the original brand.